A court in the US state of California has convicted a man of killing his wife and their unborn son. 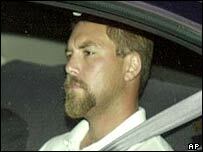 Scott Peterson, 32, could face the death penalty. The headless and limbless body of Laci Peterson and the decomposed remains of her foetus were found washed up on a San Francisco Bay beach in April 2003. Prosecutors told the court Peterson strangled or smothered his pregnant wife to escape what he may have viewed as the drudgery of marriage. The former fertiliser salesman was convicted of one count of first-degree murder for killing his wife and one count of second-degree murder in the death of the unborn child. The case fuelled the abortion issue because of the debate over whether Peterson could be charged for the murder of a technically unborn child. The verdict came after a five-month trial that attracted widespread media attention. 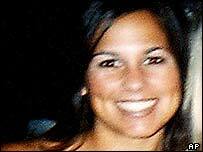 Laci Peterson, 27, was eight months pregnant when her husband reported her missing from their home in Modesto, California on 24 December 2002. Prosecutor Rick Distaso told the jury that Peterson killed his wife and dumped her weighted body overboard from his fishing boat. "He wants to live the rich, successful, freewheeling bachelor life," Mr Distaso said, quoted by the Associated Press. "He didn't want to be tied to this kid the rest of his life. He didn't want to be tied to Laci for the rest of his life." Mr Distaso argued that he killed his wife for money and to be with his mistress, Amber Frey, the New York Times reported. Defence lawyers argued that Mrs Peterson was abducted by strangers who murdered her. They said the prosecution's case was built on circumstantial evidence. The verdict came after a week of deliberations in which two jurors were removed for unspecified reasons and the judge told the panel to start again, twice. The jury will now decide whether he should be receive the death penalty or life imprisonment.